Austin Powers is on a rampage! It started when Gary Brown, known for his wonderful impersonations and performance skills, used his “pleasure time” dressing up and impersonating this well known character. From then on, his mojo went loose, and he has performed this role on many occasions. Austin Powers aka Gary is a Man of all Trades, from dance routines, singing those well known 60’s tunes, to enticing the crowd to participate in events and capture the energy around them. He makes a great MC for your awards night or gala dinner fitting into a host of themes or eras - let's face it the boy is timeless! Austin Powers has Stars in his Eyes Great for after dinner entertainment. 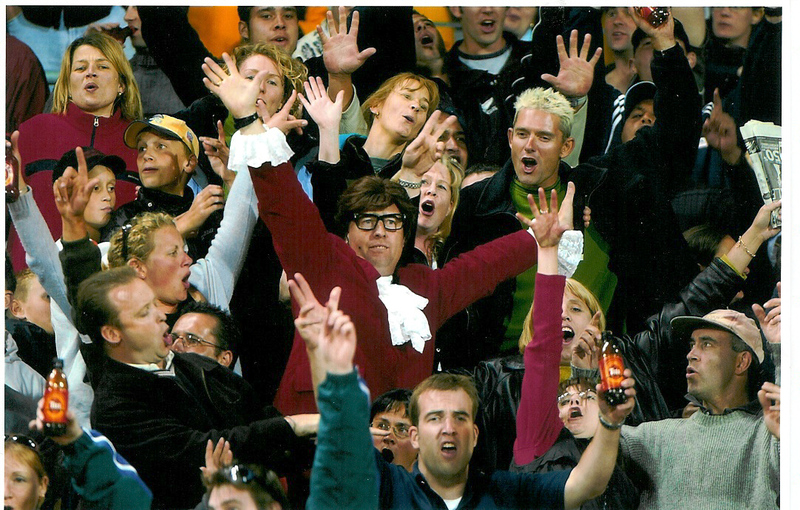 Have a terrific time with Austin Powers and his celebrity friends from the hit TV show "Stars in Their Eyes". Dress in your favourite Retro 60's and 70's gear and enjoy a night of non-stop laughs and great music. As you know Austin does not like to party alone so he can bring some of his friends along to entertain you. Depending on availability and the size of your function, we can organise Felicity Shagwell, Dr Evil, the Fembots, Johnny Cash, Kylie, Cher, Neil Diamond, Elvis, Michael Jackson... an All Star cast. The Austin Car "Austin Beetle"
You can hire Austin's Beetle (pictured on right) for your event to arrive in style or as a decoration for your theme event. Austin can pick you up and transport you to your event or he can arrive in style for all your guests to see. Our Austin is also a professioanl DJ so he can provide his groovy DJ'ing skills after dinner - oh yeah baby! "The charisma and energy you have on stage is infectious and together with the other performers in your crew... you added a whole lot of 'shaggadelic glamour' to our event. It was great working with you Gary, you sure can work the crowd... here's to next years event." Austin Powers is available locally and internationally now.